It's the era of peace and love in the 1960s, but nothing is peaceful in Caroline's life. Since her beautiful older sister disappeared, fifteen-year-old Caroline might as well have disappeared too. She's invisible to her parents, who can't stop blaming each other. The police keep following up on leads even Caroline knows are foolish. The only one who seems to care about her is Tony, her sister's older boyfriend, who soothes Caroline's desperate heart every time he turns his magical blue eyes on her. Tony is convinced that the answer to Jess's disappearance is in California, the land of endless summer, among the street culture of runaways and flower children. Come with me, Tony says to Caroline, and we'll find her together. Tony is so loving, and all he cares about is bringing Jess home. And so Caroline follows, and closes a door behind her that may never open again, in a heartfelt thriller that never lets up. Emily Ross is an editor at DeadDarlings.com, a website dedicated to the craft of writing. 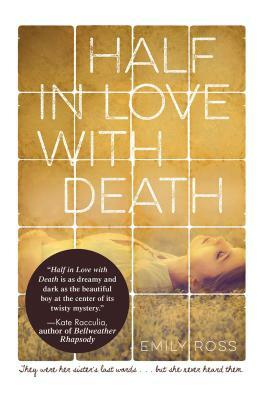 Before its publication, her debut novel, Half in Love with Death, won a fiction award from the Massachusetts Cultural Council. "An incredible debut by Emily Ross. The book’s characters were gripping and intense, the ‘60s setting was gorgeously written, and the suspense kept me up late into the night, my heart racing, almost afraid to turn the pages."